Culet (pronounced kew-let) – The cutlet is the pointed vertex at the bottom of the diamond. During the manufacturing process, the culet is often polished as a flat facet so it does not get chipped while other facets are polished. Typically this extra facet is “closed” into a point. Pre Modern Brilliant Cutting Era, diamond culets were not closed; instead they were left open as with an extra facet on the bottom. However, in the 1920’s Tolkowsky introduced the “Modern American Cut” and closed culets became the standard. In fact, there are some people who believe that if you do not close a cutlet, an evil spirit can enter into the diamond. It is common to see diamonds with damaged culets showing the damage area running from the culet up the entire pavilion facet to the girdle. What is The Wrong Size Culet? 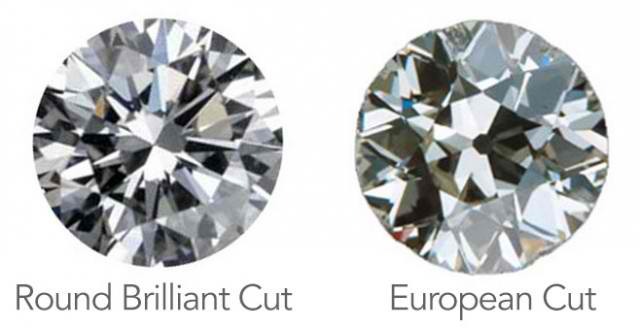 Diamonds that have Medium, Large or Extremely Large Culets are less desirable because the culet facet may be visible to the naked eye when viewed through the table facet. 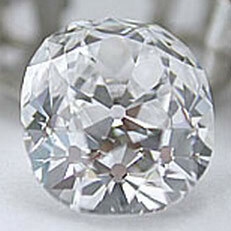 Large culets are common in diamonds that were cut pre 1920’s. They are often referred to as Old European or Old Mine Cut Diamonds. Large culets may also indicate the culet is chipped or broken off. Pictured to the left is a prime example of an Old Mine Cut Diamond with a large culet. The open culet allows light to travel directly through the diamond, lowering the diamond’s brilliance, scintillation, and in this case reflect several images of the culet around the pavilion of the diamond when viewed from the top. Below is GIA’s and other gemological laboratories’ list of abbreviations used on Diamond Grading Reports that describe the diamond culet. What is The Correct Size Culet? Culets that are Medium, Large, Very Large and Extremely Large should be avoided as they adversely affect a diamond’s brilliance and scintillation performance. Culets that are Small, Very Small, Pointed, and None are preferred.